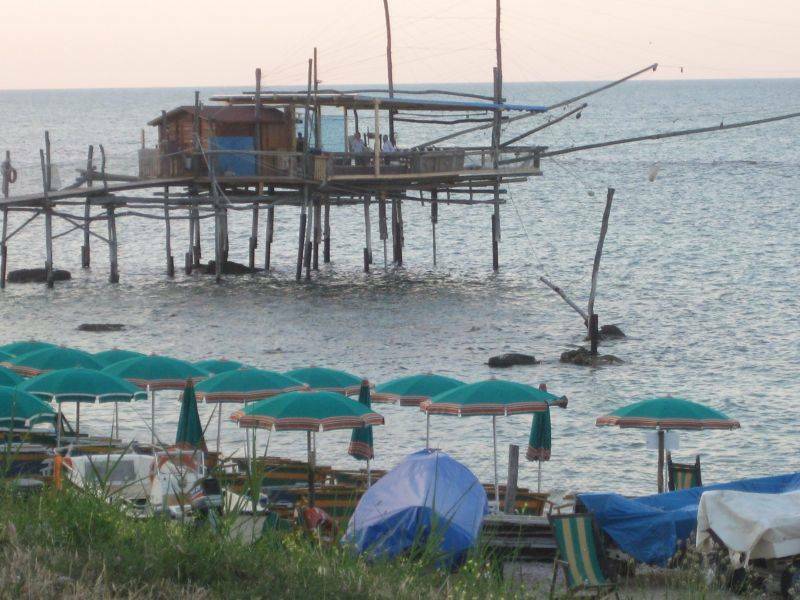 Fishing platforms built over the Adriatic are typical along the Abruzzo Coast. At first sight, a trabocco resembles a gigantic lumbering crustacean emerging from the Adriatic Sea. Set on tall, slender wooden posts that rise high above the water, a trabocco is a platform with long wooden arms extending in different directions. Ropes and nets are suspended from the arms. Years ago, the trabocchi enabled fishermen in the province of Chieti in Abruzzo to work under all weather conditions. Today, they are recognized as a historic treasure and symbol of the region. Many trabocchi have been restored and are used as restaurants. What is it like to dine aboard a trabocco? Recently, I had the opportunity to find out. It was twilight when the other guests and I arrived at the trabocco owned by Mr. Romanelli, the president of Cantina Frentana, a cooperative winery in nearby Rocca San Giovanni www.cantinafrentana.it. To get to the platform, we walked single file along a swaying wooden ramp lit with twinkling lamps. Once on board, we were greeted with frosty glasses of dry, sparkling Cococciola, made from the grape of the same name. As I sipped the wine, I had to avoid looking down through the floorboards or all around us at the water. In the middle of the platform, I was amazed to see a long, elegantly set dining table. There was a small enclosure with a well equipped kitchen where the cooks were hard at work preparing our meal. We started with a plate of cold appetizers including octopus salad, raw pink shrimp and cannochie, or mantis shrimp. ith clam sauce. The Vallevo Trebbiano d'Abruzzo (an excellent buy at about $10) was an ideal match with the primi. 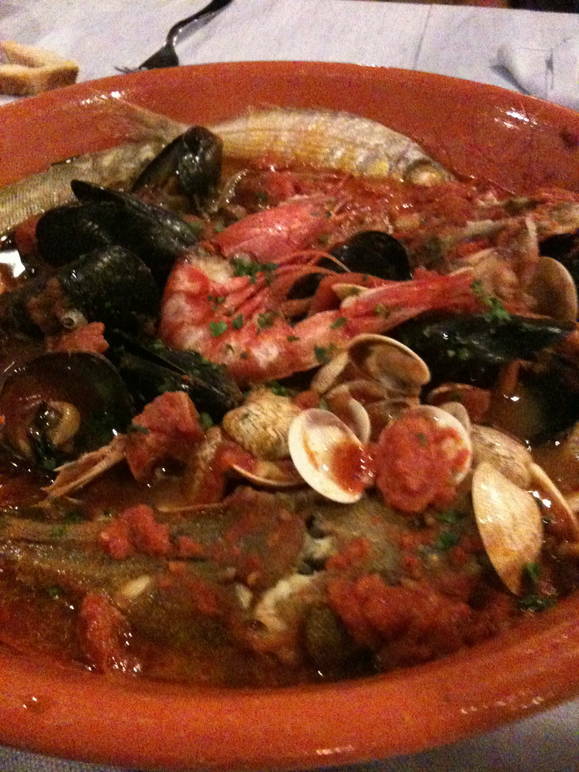 The main dish was a fantastic seafood soup or stew made with countless varieties of fish and seafood. With it we drank the Vallevo Montepulciano d'Abruzzo Cerasuolo rose from Cantina Frentana. We ended the evening with sweet slices of watermelon and delicious little cakes known as bocconcini stuffed with dark chocolate and grape must. If you are looking for a unique dining experience, try a trabocco. Perched high above the water, it's the aquatic equivalent of dining in a treehouse.